RGF recently carried out an intensive survey to more fully understand what motivates people to either stay in the job they have or move to pastures new. The survey covered Vietnam as a whole with separate attention paid to Hanoi and Vietnam. With over 550 responses it provides an interesting look into motivational factors within Vietnam’s ever-increasing skilled workforce. By far the largest number of respondents was from Ho Chi Minh City. The southern powerhouse is fast becoming one of the most sought after locations for people searching for work within Southeast Asia. Predictions indicate that this upturn will continue; the future looks very bright for the country as a whole and Ho Chi Minh City in particular. Concentrating of Vietnamese nationals, almost 60% of the respondents were in the 33 to 48 age group, which is a highly sought-after demographic among recruiters. Favored occupations were IT & Telecommunications, Manufacturing and Engineering, and Banking and Financial. Though in all some 13 different areas of employment were covered. Responders were asked to choose the top three factors that would entice them to change occupation. Whilst unsurprisingly salary was the most popular motivational factor in seeking a move, with 76% naming it, the others were less obvious. Company culture and promotional opportunities filled the other top spots, with 45% and 43% respectively. Other factors named were more challenging work, company branding and rewards or recognition. The old adage that a company doesn’t lose an employer a manager does, was surprisingly not prominent in their thinking. Relationship with managers came in 7th place with only 20% of respondents citing this. When it came to the reasons keeping them in their current jobs, the answers were somewhat different. Fair pay structure came in at number six on the list with only 30% naming it in their top three reasons. Career progression was way out in front with 60% singling it out. Close behind and all around the 40% mark were meaningful work, being recognized and company culture. On reasons for moving jobs the survey went into more depth, it presented a number of statements and asked respondents to give their opinion by way of stating whether they strongly disagree; disagree, feel neutral; agree; or strongly agree. On the statement, do you agree that insufficient challenges in a job makes you think of changing the company? Over 50% “agreed” On the subject of work stress being the main reason over 50% either disagreed or felt neutral. Conflict with a direct supervisor unsurprisingly scored highly with 65% agreeing or strongly agreeing. Whilst conflict with coworkers in general was not such a big issue with 70% either disagreeing or remaining neutral. Inflexible working hours scored highly with around 58% either agreeing or strongly agreeing, and interestingly the lack of social contact with co-workers scored very highly where the same categories scored at over 64%. Perhaps the most highly contentious issue named was internal polices. 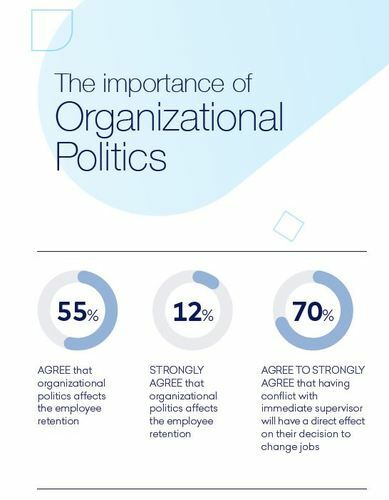 When asked the question, do you agree that organizational politics affects the employee retention? A huge 78% either agreed or strongly agreed. Whilst less surprising, the payment of retention bonuses scored highly with 70% either agreeing or strongly agreeing. On the subject of salary, the survey asked what size of incremental change in salary would make respondents consider moving. It appears that 25% is generally not enough. 35% said 25 to 30 percent would tempt them away whilst a further 34% wanted even more than 30 percent. This can be looked at in two ways really. Either the respondents are very happy in the current roles and need a large incentive to move, or the stress of interviewing and moving is not considered worth the effort without a larger incentive. Please click on the link to download the full 2018 Employee Concerns Survey report.